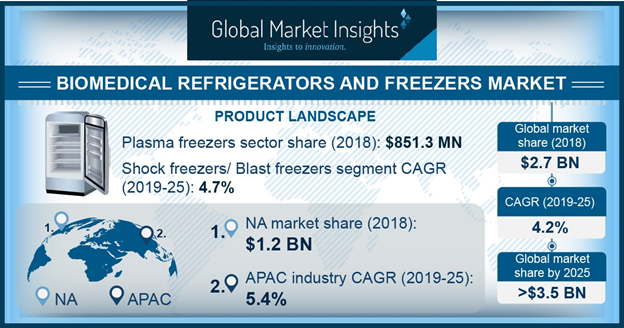 Biomedical Refrigerators and Freezers Market to Hit $3.5 Billion by 2025: Global Market Insights, Inc.
Asia Pacific biomedical refrigerators and freezers market is expected to register 5.4% CAGR over the forecast period. SELLBYVILLE, Del., February 14, 2019	(Newswire.com) - UK biomedical refrigerators and freezers market is estimated to witness significant CAGR of 3.5% during the coming years. The growth is attributable to rising geriatric population prone to several chronic diseases leading to increasing demand for surgical procedures thereby escalating the industry growth. Moreover, the focus of industry players on R&D activities to enable modifications in the biomedical refrigerators and freezers to sustain competition will stimulate business growth. Global Biomedical Refrigerators And Freezers Market will surpass USD 3.5 billion by 2025; according to a new research report by Global Market Insights, Inc. Extended use of biomedical refrigerators in the process of drug discovery is one of the major factor driving the biomedical refrigerators and freezers market growth in the coming years. Development of new drug and its introduction into the market is a lengthy procedure involving numerous clinical trials and studies. Biomedical refrigerators and freezers play a significant role in the storage and protecting these drugs, and sensitive ingredients for continuity of research. Growing disease burden and rising demand for advanced treatment will positively influence biomedical refrigerators and freezers industry growth over the forthcoming years. Furthermore, the high demand for organ transplants, blood transfusions, biopharmaceuticals, and cellular therapies will favor industry growth. The rise in the number of blood banks, research laboratories, hospitals, diagnostic centers, and educational institutes should further escalate the adoption of biomedical refrigerators and freezers thereby boosting business growth. However, the high cost of equipment coupled with the growing use of refurbished equipment may hinder biomedical refrigerators and freezers business growth during the analysis period. Blood banks segment is estimated to show lucrative CAGR of 4.5% over the forecast timeline due to a surge in demand for blood and blood components. The increasing number of accident cases demand large amounts of blood supply, thus augmenting the blood banks segmental growth. The growing adoption of biomedical refrigerators and freezers for storage of blood at optimal conditions in blood banks thereby will escalate segmental growth. U.S. market size accounted for USD 1.0 million in 2018 and will witness similar growth over the analysis period. An increasing prevalence of chronic diseases such as cancer, cardiac disease, and respiratory disease increases the demand for personalized medicines. should further drive regional business growth. Furthermore, favorable government initiatives in the region coupled with advancements in technology and the presence of well-developed healthcare infrastructure will prove beneficial for the regional business growth. Global Biopreservation Market surpassed USD 4 billion in 2017 and is expected to witness around 13.4% CAGR from 2018 to 2024 owing to the increasing prevalence of chronic diseases such as cardiac, renal diseases, diabetes, and obesity. The Ultra-low Temperature Freezers Market crossed USD 150 million in 2016 and is anticipated to witness growth of over 4.5% CAGR from 2017 to 2024 impelled by rising incidences of cancer, infectious diseases and growing adoption of personalized medicines. The European milk protein hydrolysate market demand, led by Germany, the U.K., France and Italy, is set to register significant CAGR of 5.5 percent from 2019 to 2025 supported by increasing awareness regarding nutritional requirement for infants among parents and high purchasing power for these products. North America Switchgear Market to Hit $25 Billion by 2025: Global Market Insights, Inc. The United States switchgear market was valued at over USD 12 Billion in 2018 and is projected to secure lucrative CAGR from 2019 to 2025 owing to regulatory reforms toward the refurbishment and revamping of the existing power infrastructure.